McMansions and haunted houses in literature and movies. The suburban monstrosities fit in a long American tradition of unnatural, ill-constructed, haunted houses. What is it that so unnerves us about McMansions? Why are they so ugly, why do we hate them, and why—despite their atrociousness—do builders keep building them? These are the questions that the blog Worst of McMansions (aka McMansion Hell, per its URL) sets out to answer. Authored by an architect who calls herself “Kate,” the Tumblr has been around only since late July but has spread across the web faster than a subdevelopment through a vacant tract of suburbia. The site catalogs the most egregious examples of terrible overbuilt architecture, delivering ridicule to these behemoths—along with a series of McMansions 101 posts, which explain patiently everything that’s wrong with them, architecturally speaking. The site’s fans seemed to have flocked to it not just for its ability to put words to that uneasy disgust that so many have when facing these gargantuan homes. We’ve always known they were ugly, but until now we didn’t know why, exactly. A normal house, for example, is made up of a “primary mass” (the central architectural shape of the building) and a few key “secondary masses,” building-block shapes that complement and highlight that primary mass. A McMansion, on the other hand, will have so many secondary masses—gables, garages, entryways, and so on—“that the primary mass is reduced to a role of filling in gaps between the secondary masses.” Nor is the McMansion balanced; unlike a Victorian, its individual pieces don’t have equal visual weight. It is often out of scale with its small lot and out of proportion with itself: inconsistent window sizes, dormers, and gables of contrasting style. 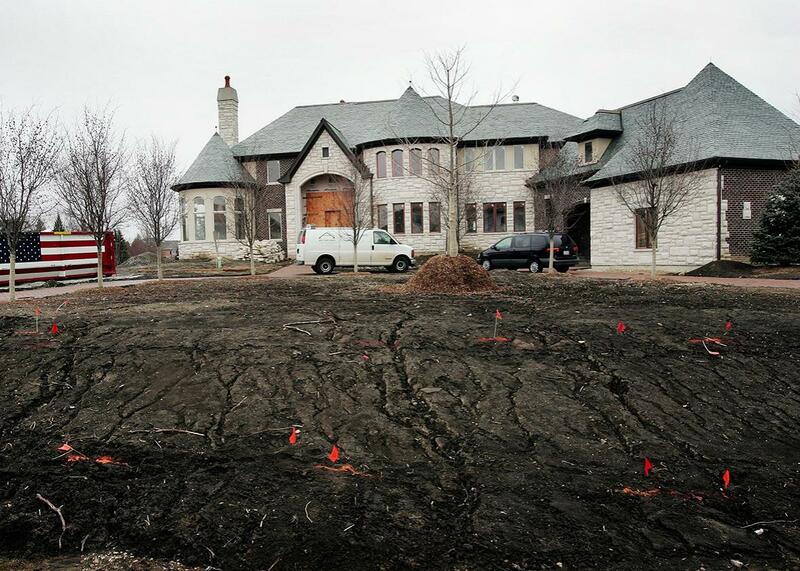 What emerges in Kate’s McMansions 101 posts in particular is that nearly all of the sins of McMansions often boil down to the same thing: violations of order, harmony, and symmetry. What makes a normal house successful is a sense of balance, with equally weighted elements and an overall sense of aesthetic cohesion. What makes a McMansion an eyesore is its jumble of eaves, columns, oversized garages, and other compounded fiascos. The term McMansion is itself still relatively recent, coined only in 1992 according to the Oxford English Dictionary. But the landscape of America has long been populated by these off-kilter, jumbled houses, homes whose shape defied all balance and order. At least since the 19th century, we’ve had to deal with ostentatious monstrosities, built without symmetry or class, gargantuan hallmarks of the nouveau riche. 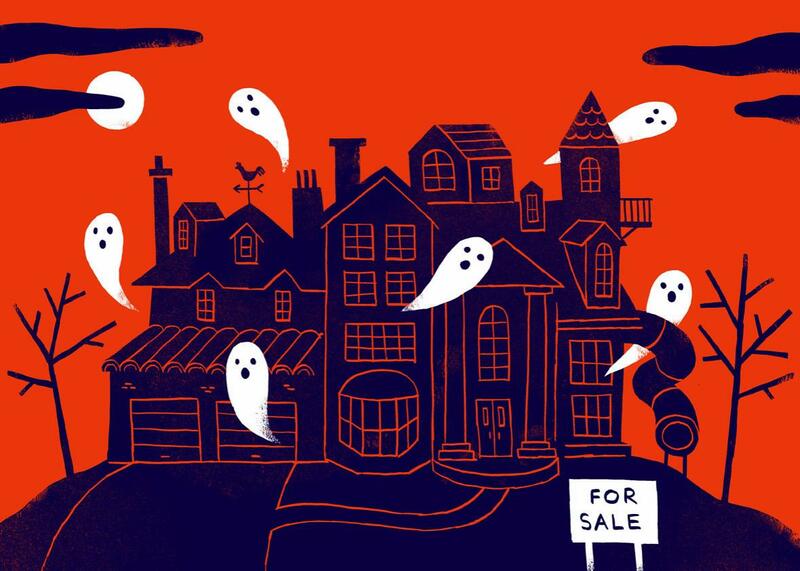 We didn’t call them McMansions back then; we called them haunted. The archetypal American haunted house has always been one whose construction was aesthetically unbalanced. Take one of the most famous American haunted houses, Nathaniel Hawthorne’s house of the seven gables. Defined by its “seven acutely peaked gables, facing towards various points of the compass, and a huge, clustered chimney in the midst,” the house is the ill-gotten gains of Colonel Pyncheon, who accuses his neighbor Matthew Maule of witchcraft in order to acquire his land. There is no order or symmetry to the house; indeed, it’s not even clear where the front of the house is, since it lacks any kind of façade or welcoming front door. The titular, odd-numbered gables poke out in different directions, overwhelming the house with secondary masses and voids. A McMansion 150 years before the term was invented, Hawthorne’s creation set the template for a house that exemplifies wealth without class, ostentation without order. This twinning of ugly house and haunted house is a long-standing feature of American ghost stories; alongside Hawthorne’s novel is Poe’s House of Usher, with its “bleak walls,” “vacant eye-like windows,” and “rank sedges,” all of which combine to engender in the narrator “an utter depression of soul.” In attempting to unravel the mystery of the house’s façade and why it instills in him such unease, the narrator repeatedly tries—and fails—to name the source of his terror. The wrongness of the house seems to stem from some contradiction between its overall façade and its individual elements: “No portion of the masonry had fallen; and there appeared to be a wild inconsistency between its still perfect adaptation of parts, and the crumbling condition of the individual stones.” Though the Usher mansion is old, the residence of a long-decayed aristocracy, Poe’s description of the house in some ways mirrors Kate’s description of McMansions: an architectural hodgepodge, in which the individual elements, out of sync with one another, add up to an overall sense of unease and disgust. A McMansion under construction in 2006 in Inverness, Illinois. What is this connection between odd constructions and ghosts? Perhaps it’s because these strange buildings defy common sense and time-honed principles, creating in us a sense of unease that’s hard to name. The principles of architecture—the ones so readily abused by McMansions—didn’t appear overnight; they emerged from centuries of use and tradition. They reflect how we move through houses and how we are most comfortable in them. They maximize the kinds of spaces where we feel most at home, organized around layouts that facilitate ease of use and movement. In time they become second nature: You don’t expect a front door to open into a bedroom or to find a kitchen on the second floor—even though, technically, there’s nothing stopping a builder from laying out a house in such a way. So when a space is off in subtle ways, when it violates these ergonomic principles we long ago internalized, we often sense it without even realizing it. You may walk into a room where a ceiling fan is off-center, or a fireplace is on the wrong wall, and not immediately identify what’s wrong, yet you still feel the imbalance in the room. In the absence of a good vocabulary to describe that sense of unease, we often fall back on the language of hauntings. A house that’s settled uneasily in its foundation, so that doors swing closed by themselves, and whose layout may trigger a feeling that something isn’t it right—how easy it is to call it haunted, to blame that sense of unquiet on a ghost. The lexicon of the paranormal, after all, is far more ubiquitous and widespread than that of architectural principles, and the language of ghosts is often far easier to call upon than that of primary and secondary masses. So while we think of the archetypal haunted house being a gothic Victorian or disused palatial estate, it may be that in time the McMansion itself, with its imbalance and hectic abuse of orderly principles, might also come to be seen as the home of ghosts. After all, one of the most profitable films ever made is not just about a haunted house, but a haunted McMansion. Paranormal Activity begins with the predictable tropes of the American dream: a new couple, Katie and Micah, having recently moved into their dream house, a four-bedroom, 2½-bath monstrosity in the San Diego suburbs. While we never see the exterior of the house used in the film (once owned by director Oren Peli himself), MLS photos from its 2015 sale reveal it to be a predictably horrific McMansion, violating nearly all the principles in Kate’s Tumblr (though, mercifully, it does lack columns). The primary mass is dwarfed by the garage, above which teeters another out-of-balance mass that further obscures the design of the house. The front door is barely visible, the windows are irregularly sized, and the structure as a whole is garishly unbalanced. Part of Kate’s criteria for a McMansion is a surplus of usable bedrooms; in a well-designed house, Kate writes, “each of the rooms has a designated purpose/person.” In Paranormal Activity, the childless Katie and Micah seem lost in their four-bedroom house; aside from the master bedroom, it’s not clear what they’re doing with all those extra rooms, adding a sense of confusion that subtly works on the viewer. It’s a large house, but with the film’s use of a found footage aesthetic, there’s an overwhelming sense of claustrophobia inside the walls: We never see its exterior, nor do we see the entire interior. The cinematography echoes the innate distortions of the McMansion’s architecture. Like The Shining’s Overlook Hotel, it remains unsettlingly cavernous: Where are the other rooms, and what’s hiding in them? One of the compelling aspects of Paranormal Activity is the idea that the haunted house is no longer just the creepy mansion at the edge of town; now it’s also the eyesore McMansion next door. In the film, we learn that a demon has followed Katie throughout her life, starting in childhood, but has left her alone throughout her teenage and adult years, only now returning to haunt her. According to the psychic she consults, something has apparently triggered it recently, instigating the events of the film. Perhaps what’s triggered the return of this demon is the house itself: an ill-fitting American dream turned nightmare, a McMansion uncanny in its design and unsuited for its occupants. Surveying the landscape of atrocities chronicled in the Worst of McMansions, the question we might ask ourselves is not just why do we keep building such ugly homes, but why do we keep building homes we know will attract ghosts? Prospective home buyers best beware; in the past 10 years, foreclosures and short sales have unleashed hundreds of similarly awful McMansions onto the market at rock-bottom prices, and if their ugliness is strong enough to unleash ghosts and demons, expect more hauntings to come to a suburb near you. Paranormal Activity, released in 2007, seems in retrospect particularly prescient: We were then still a year away from the housing crisis that would turn so many McMansioned suburbs into a different kind of ghost town. Maybe Katie and Micah are lucky a demon got them before Fannie Mae could.